Fixed my Revox today. I always say: Never throw anything away. You could use it one day. Probably just the day after having disposed of it. You know that. To cut a long story short: I have 3 Revox machines, one is working, one isn’t any more, the third was given to me by my hifi vendor just in case I could use some spare parts. This year I was several times on the edge of throwing those latter two away! Lucky me I didn’t. Because today I wanted to copy some reel-to-reel masters onto my computer to mp3 them for your listening pleasure. When doing so the machine started to make some weird sounds, and I detected that in the heat of the summer a small rubber wheel that presses the tape to the recording head had literally melted! Ok, so that has been fixed now – to order the part from Revox would have cost real money, that’s where the money is made, on the replacement parts. Plus I would have waited 10 days for delivery, at least. So here we are, ready to copy the summer masters. You’ll hear about them soon. For now, just a glimpse into the charts hungry side of Calypso Now. 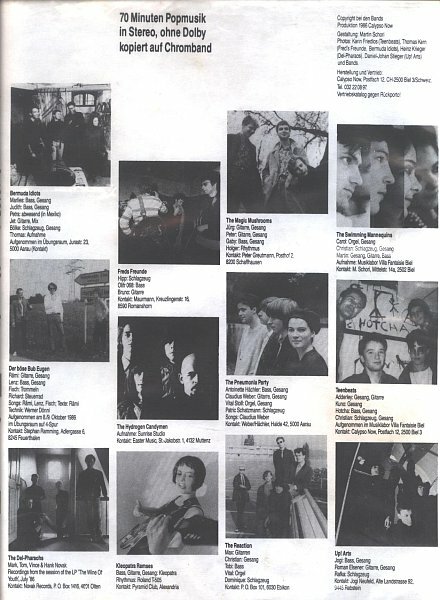 Summer 1984 saw the release of the famous Cassingles (‘Splendid – The Sound Of Young Switzerland’), Summer 1986 the sampler ‘Chart Attack’, followed by ‘Guitar Town’ in ’87 (summer, of course), a sampler with bands from Geneva, at that time the capital of swiss garage. Remember: The Maniacs, The Needles, The Faster. I’ll give you some tracks of Splendid and Guitar Town soon. 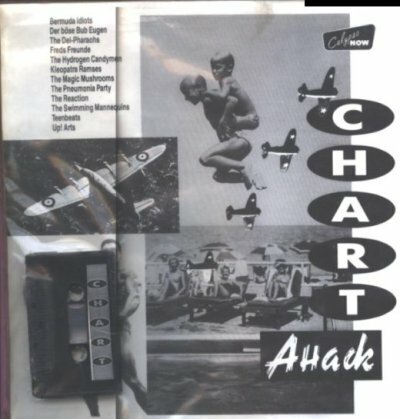 Today, to celebrate my newly fixed Revox, the first three tracks from ‘Chart Attack’. Ajust playback volume to 10 and press the play button! Tired, have to go. Had too much work restoring certain cassette masters, finding the right hardware and, much more difficult, the right software. Am using Audacity now, a great open source program. A bit more difficult to use than Goldwave, what I used before, but better quality, at least on my hardware.